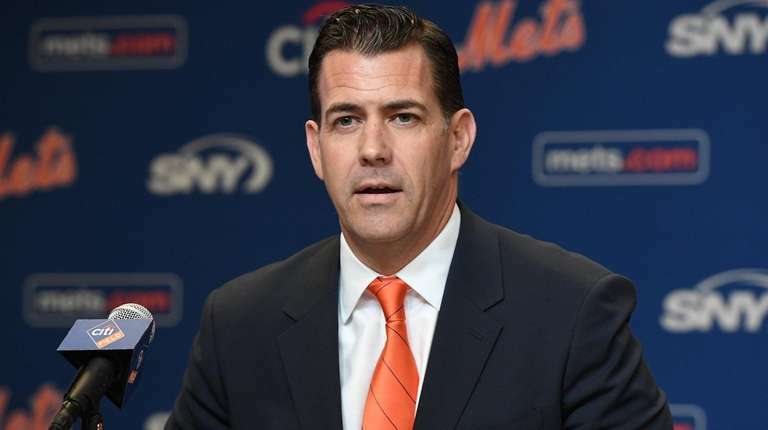 New general manager Brodie Van Wagenen has a list of things to do, and fans can expect Mets to be active. That’s how Mets chief operating officer Jeff Wilpon recently described the new general manager’s degree of busyness as the hot stove heats up. And for the Mets in particular, it’s poised to get hotter at the Mandalay Bay Resort and Casino through early Thursday afternoon. These winter meetings will be different for Wilpon: He’ll be physically present. Van Wagenen specifically requested his presence this time around. That will make communication significantly easier than it was while Van Wagenen negotiated the Mariners trade -- with Wilpon tracking gorillas in Rwanda and calling his staff with a satellite phone. Now, Van Wagenen joked this past week, Wilpon will be in a different kind of jungle. The Mets’ to-do list — which almost definitely won’t be completed in its entirety this week — is manageable. Wilpon described Van Wagenen’s targets as bullpen help, an upgrade at catcher, a utility infielder and “maybe” a centerfielder. That outfield hole is arguably the toughest to fill. Van Wagenen has acknowledged the Mets’ talks with free-agent centerfielder A.J. Pollock, who has spent his entire pro career with the Diamondbacks, but the list beyond Pollock doesn’t contain many particularly desirable names. The injury-prone Pollock is far from perfect, too. The best-case scenario is 2015, when he had a .315/.367/.498 slash line, was an All-Star, won a Gold Glove and played in 157 games — the only time he has passed the 140-game mark. Since 2014, Pollock has spent time on the disabled list with a right hand fracture, right elbow fracture, right groin strain and left thumb avulsion. He has averaged 101 games per year the past six seasons, albeit while providing above-average offense and defense when he is on the field. As for the bullpen, the pool of free-agent relievers is deep but the market is not particularly developed. Craig Kimbrel, Andrew Miller, Adam Ottavino, Zach Britton, Jeurys Familia, David Robertson and others can be had. Which of those do the Mets like most? We should know more in the coming days. Nobody of note has signed yet, so filling in the bullpen behind closer Edwin Diaz might wait until the Mets have taken care of some of their other needs. Van Wagenen will seek to do all that with publicly unspecified payroll constraints. “He understands exactly where we are and what the parameters are,” Wilpon said. Wilpon noted that as rosters stand now, the Mets’ internal projections estimate that they would win 88 to 90 games, up from about 83 wins before the Cano/Diaz additions. The Braves took the NL East title, in a down year, with 90 wins in 2018. With everybody but the Marlins going hard on improvements this offseason, it looks as if it will take several additional wins to claim the division title in 2019. Wilpon’s motto seems to be clear: In Brodie he trusts. Dec. 9-13, 2017: Two days after the meetings, the Mets sign free agent Anthony Swarzak. The only announced deal at the meetings was the trade of RHP Burch Smith to the Royals for a player to be named or cash. Dec. 4-8, 2016: A week after the meetings, the Mets sign RHP Cory Burns and RHP Ben Rowen, both free agents. Dec. 7-10, 2015: The Mets acquired 2B Neil Walker from Pirates in a trade for LHP Jon Niese, and later sign free agent INF Asdrubal Cabrera. Dec. 7-10, 2014: Five days after the meetings ended, the Mets signed free agent OF John Mayberry Jr.
Dec. 9-12, 2013: Free agent OF Curtis Granderson gets a four-year, $60 million deal, and two days after the meetings, the Mets sign RHP Bartolo Colon for two years, $20 million.